Sophie Wessex was the picture of elegance, as per usual, but she also didn't offer any jewel surprises, wearing the same pearl cluster earrings and brooch that she's been sporting frequently over the past few weeks. Princess Anne wore a golden brooch, plus pearl stud earrings, but the real story? THAT HAT. What in the world is growing underneath the brim??? No jewelry, as usual, for Princess Beatrice. And I'm concerned that her hat is making a run for it. Zara Phillips was sunny and happy in a petite yellow and taupe hat, plus small earrings. Royal Ascot is the gift that keeps on giving in terms of royal reaction photos. Here, Autumn Phillips wears silver-toned earrings amid her shock! The Duchess of Gloucester wore the same set of sapphire and diamond earrings and clips that she wore recently at a garden party, but this time she placed the clips side by side. The patch was back for Princess Michael of Kent, who coordinated it with her black-and-white jewels, hat, and dress. Lady Sarah Chatto was also in bold black and white colors, wearing earrings that belonged to her late mother, Princess Margaret. (I think the brooch may also be one of Margaret's, but I can't be sure from this angle.) But the bigger question: is that a real camera or a fancy purse? One more customary royal guest stopped by for the first day: Princess Haya of Jordan, wife of the Sheikh of Dubai. Love the small pearl earrings, totally perplexed by the hat. There is such a thing as too many flowers. 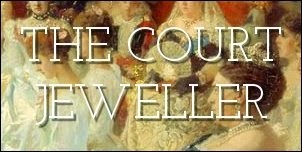 Stay tuned for more Royal Ascot jewels all week here at The Court Jeweller!